The first step in preparing to install a waterborne radon reduction system is to discuss the water quality and treatment goals with our clients. Our US Radon Management, Inc technicians must know the amount of radon present in the well water in order to determine the proper system for the well that is to be treated. Radon levels above 5,000 pCi/L, for example, are over the EPA¹s recommendation for GAC. A full water analysis is recommended to help determine whether other physical or chemical contaminants are present that would require pre-treatment. Iron, manganese, lead, nitrates, etc. may adversely affect the performance of the selected radon removal system. Although each laboratory has a preferred water sampling method, all require an air-free sample to assure accuracy. This sampling is best left to an experienced professional, as the test results can be inaccurate when the sample is not collected correctly. Also, be aware that liquid scintillation is listed by the EPA as the best available technology (BAT) for waterborne radon testing. The next step we take to prepare for system installation is to determine the home¹s water flow rate, in terms of gallons per minute. This enables our waterborne radon professionals to properly size the selected radon removal system. Once the system is installed, outflows from the radon system should be consistent with the inflow volume. Next, we select a location for the waterborne radon system that meets the manufacturer specifications for the equipment and allows for access when servicing. Ideal locations will minimize plumbing, electrical, and vent line complexities. Whenever possible, we also consider a location that meets the owner¹s preferences. Plumbing: To preserve water pressure after system installation, it is important that the system plumbing pipe size be compatible with the plumbing pipe of the home. Electrical: The installation of aeration equipment requires an electrical hook-up of the system to the home. The manufacturer¹s specifications, national and local electrical codes must be taken into consideration when evaluating the site for a system installation. 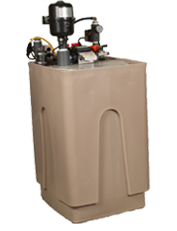 US Radon Management, Inc vents all waterborne radon aeration systems in accordance with the manufacturer¹s specifications and the EPA Radon Mitigation Standards (RMS).